Oconee County Board of Commissioners Chairman Melvin Davis has taken steps to distance himself from the county’s decision to spend nearly $10,000 for design work to reconnect Old Mars Hill Road to Mars Hill Road proper. That is true even though Davis has been exonerated of any wrongdoing for his involvement in the proposal under the county’s ethics ordinance and although the email correspondence indicates Davis initiated the discussion more than a year ago and has been involved from that point forward. Davis told the four voting commissioners in an email message on Aug. 20 that the county did not have a design in place, despite the fact that County Administrative Officer Jeff Benko told Davis he would talk to him on Aug. 4 about the design modification. Davis restated his position that he was out of the loop on that design last week in comments published in The Oconee Enterprise, and he added a new assertion. I sent Davis email messages on Thursday and Friday asking him if he had been misquoted in the Oct. 22 edition of the Enterprise. I used two different sending email addresses to make sure the message got through. Davis, who carries a mobile phone with him and makes frequent use of it for county correspondence, did not acknowledge receipt of the email or reply. Davis largely controls the agendas for Board of Commissioners meetings. He sent out a notice to the commissioners at 9:21 a.m. on Aug. 20 telling them that “a potential connection of Old Mars Hill Road to Mars Hill Road at the median cut across from the entrance to Barber Creek Estates” will be discussed at the Aug. 25 BOC meeting. When County Clerk Jane Greathouse released that agenda at 3:01 p.m. on Aug. 21, it contained discussion of the “Mars Hill Road Improvement Project” to include the reconnection of Old Mars Hill Road. But Greathouse also released a second agenda, for the Sept. 1 meeting, that included approval of the modification at a cost not to exceed $115,000. That inclusion on the consent agenda means that the expectation was that the change in design would be approved tentatively at the Aug. 25 meeting, not at some point in the future after a public hearing, as Davis told the Enterprise. 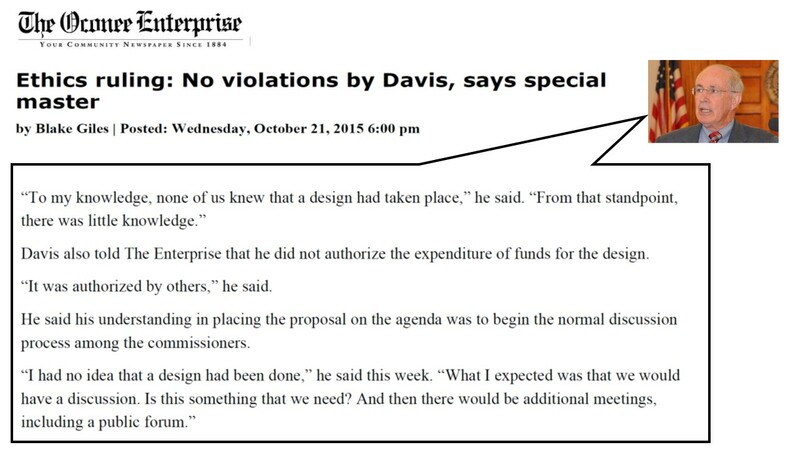 The $115,000 cost included in the Sept. 1 agenda was based on the design that Davis told commissioners on Aug. 20 did not exist. Public Works Director Emil Beshara had told Administrative Officer Benko in an email message at 2:43 p.m. on Aug. 3 that “GDOT is on the cusp of approving the project modification” for the reconnection of Old Mars Hill Road. He said the cost would be $115,000. Beshara apologized a few minutes later (4:29 p.m.) for the “short notice” and said “I just met with GDOT about this today.” Beshara earlier in the year had reported that GDOT was not interested in making the change. I obtained all of these messages via a series of open records requests. 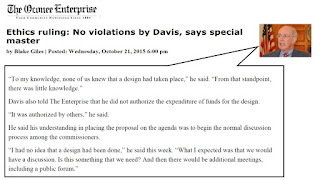 In the Enterprise article Davis did not name the “others” who he said made the decision to spend the nearly $10,000 for the design modifications. The email correspondence I received in my open records requests indicates that Davis, Benko, Beshara, people working for Moreland Altobelli, which has responsibility for the roadway design, people working for Beshara, and people at GDOT were involved in the discussions. Moreland Altobelli and GDOT personnel could not have authorized the $10,000 expenditure, since it was of county funds. So that leaves only Benko, to whom Beshara reports, and Beshara himself. Benko was out of the office last week after undergoing emergency surgery the week before. I did not attempt to contact him. I asked Beshara in an email message late on Thursday morning who authorized him to approach Moreland Altobelli to modify the design for Mars Hill Road to reconnect Old Mars Hill Road. I asked Beshara if he assumed it would cost money to get the plans modified. He said he expected it to cost $15,000, “based on past experience on this project.” The price came in at just under $10,000. “The cost of complying with the Chairman’s request was not something I was asked to consider,” Beshara said. Beshara added the following comments to his response to me. “I first learned of Melvin talking to Mr. Aycock about this project in September of 2014 (9/4/14). As early as December of 2014 Melvin was asking about a design change to connect Old Mars Hill (12/15/14). In February 2015 he again asked where I was with getting a plan change implemented (2/13/15). I asked MAAI to proceed with the design change proposal in March 2015 after Melvin again asked about where I was with getting GDOT to include this in their project (3/31/15). The Board of Commissioners did not approve the change in the road design at its meeting on Aug. 25. It did hold a public hearing on Sept. 22, and the audience was overwhelmingly opposed to the reconnection of Old Mars Hill Road. In fact, only Perry Aycock indicated support. Aycock owns four pieces of property along Old Mars Hill Road. At its meeting on Sept. 29, the commissioners let the proposal die without taking any action. That complaint was rejected on technical grounds, but Bell, 1201 Arrowhead Road east of Butler's Crossing, refiled it on Oct. 12. “This report should terminate this matter,” Warnes wrote. Warnes was first appointed special master to handle initial screening of ethics complaints shortly after the Board of Commissioners adopted that code in 2009. Bell's is the first complaint filed under the 2009 ordinance. The term of the special master is for two years, and Warnes has been reappointed for successive terms since that initial appointed. His current terms expires on Dec. 31, 2016. Warnes is a partner in Timmons, Warnes and Mercer, a law firm with offices in downtown Athens. Much of Warnes’ practice is in real estate law, and he last appeared before the BOC in that capacity in January of this year representing Samuel Border in a zoning issue in the south of the county. The BOC granted Border his request. Warnes also appeared before the BOC in 2013 representing CAAT Holdings, which was seeking a change in zoning for restrictions for Pebble Creek subdivision south of Watkinsville. Warnes ultimately filed suit against the county over that zoning issue, though the case subsequently was settled. I have updated the timeline for the Old Mars Hill Road story. It can be downloaded from Box.net here. Maybe we need a new Special Master who will check out the evidence before declaring that "it does not set forth material facts for which remedy can be given". Sure does look like the facts are there if your email requests are accurate. Maybe there needs to be a new filing with this article and all of the emails and phone conversations included. Amen, Anonymous. I seriously doubt that the Special Master took the time to investigate as thoroughly as Lee Becker has done. Still thankful that Mr. Becker takes the time and effort to keep us informed. Thank you, Lee Becker, for your continued efforts in apprising us of Davis' deplorable scheming. So, nobody considered cost to comply with Melvin's request? Isn't there a minimum amount for which the county has to have group authorization, the entire BOC for instance, before spending willy-nilly? Warnes' report clearly shows he gave no serious thought to nor investigation of the Ethics Complaint facts. What we need is an employment breach dispute attorney. How much is Warnes paid for this "special master appointment"? It looks like Beshara is trying to be transparent. Will be good to learn from Benko, too. The Oconee Enterprise gave insight into the "consent" timeline and quoted what Melvin said. Blame Melvin. He dug himself a deeper hole. This entire situation is disgusting at many levels! "Much of Warnes’ practice is in real estate law, and he last appeared before the BOC in that capacity in January of this year representing Samuel Border in a zoning issue in the south of the county. The BOC granted Border his request"
Shouldn't the "Special Master" be someone who doesn't do business with the county or have to appear before county commissioners in business transactions/legal matters??? There has to be someone truly independent around, whether a retired judge, UGA law professor, etc. who doesn't have a vested interest. And this is just me, but I'll bet my house that Melvin had a hand in drafting his quick defense by the so-called "Special Master"!!?? Hope Beshara's not left holding the bag or Benko. If they had not complied with Davis' request would their jobs have been in jeopardy? From the delegation of duties chart it looks like Benko should be making the decisions, not Davis. Maybe this needs to be brought up at the next commission meeting. "Shouldn't the "Special Master" be someone who doesn't do business with the county or have to appear before county commissioners in business transactions/legal matters???" Sure. But this is Melvin Davis in Oconee County. Mr. Davis probably is remembering when the whole place was run by Democrats. A few folks would attend the meetings; no e-mails, smart phones, video cameras; newspaper the same typically Democrat rag. Yes, it was that bad. The old days were not always good enough to return.